Decade-long mobile commerce hype looks finally set to deliver. Developed markets are on the cusp of mass adoption, aided by developments in technology and changing user behaviour. Yet what was once seen as simply “a new way to pay” now has much broader relevance, adding value throughout the entire retail journey. Many companies now see m-commerce as a strategic priority - some are looking to employ it to protect their core business, others will use it to apply existing capabilities to new areas. But few will find themselves in a sustainable, value-accruing position. For most, the only way to win at scale is through collaboration in the form of as-yet-untried partnerships. The next 18 months will represent a critical time in the evolution of this nascent market, as a variety of players push to achieve credible scale among both consumers and merchants. In this Perspective, we investigate the forces that are driving the m-commerce market, the benefits available, and the kinds of business models and partnerships that are seeking to achieve that credible scale over time. Booz & Company is a leading global management consulting firm, helping the world's top businesses, governments and organisations. Founder Edwin Booz defined the profession when he established the first management consulting firm in 1914.Today, with more than 3,300 people in 61 offices around the world, Booz & Co. brings foresight and knowledge, deep functional expertise, and a practical approach to building capabilities and delivering real impact. It works closely with its clients to create and deliver essential advantage. For Booz & Company's management magazine, strategy+business, visit www.strategy-business.com. 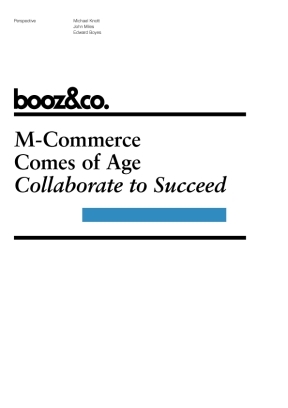 Visit www.booz.com to learn more about Booz & Company.